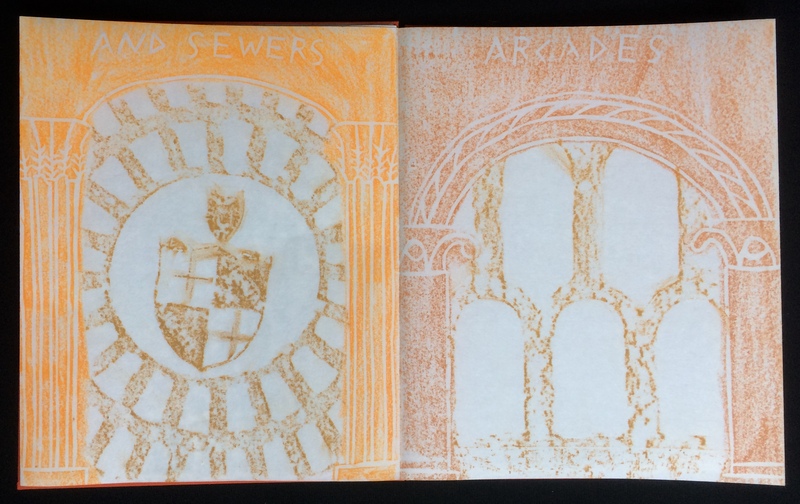 This edition is the first of what will be a series of books on cities made of rubbings from their historical and contemporary surfaces. Most cities that have existed for thousands of years, like Bologna, still show traces of the many cultures and periods that have physically marked them. Bologna has had a long series of inhabitants, from before the Etruscans, to the Gauls, Romans, and Lombards. The University of Bologna, founded over 900 years ago, has had a tremendous impact on the city, as did Bologna’s status as a papal city, when it was considered the second city in importance after Rome. The Romans were responsible for much of the infrastructure in Bologna, including the aqueducts and sewers. Roman history is recorded on incised tablets still buried, or housed in the civic museum of Bologna. Christianity sculpted the face of the city with its churches, abbeys, and convents, still standing today. Tablets and inscriptions inside the churches record historical and sacred events. The university influenced the city in a structural way as well, and established Bologna as a center for medicine, science, and technology. It gave money for completion of the church San Petronio in return for the installation of a large, brass meridian inlaid in the church floor which marks the hour of 12 noon throughout the year with a ray of light passing through a hole in the roof. The university also erected many buildings, including a tower for astronomy. Perhaps most significantly for Bologna’s modern appearance was the extension of the facade of each building, above the sidewalk, to create extra rooms for university students. This resulted in thirty kilometers of arcades, supported by columns with varied capitals, which even today protect pedestrians from rain and hot sun. As bronze reliefs in the past were commonly cast using wax, the front cover of the book is stamped with a design of an Art Nouveau vent found on the main street of Bologna, Via Rizzoli. 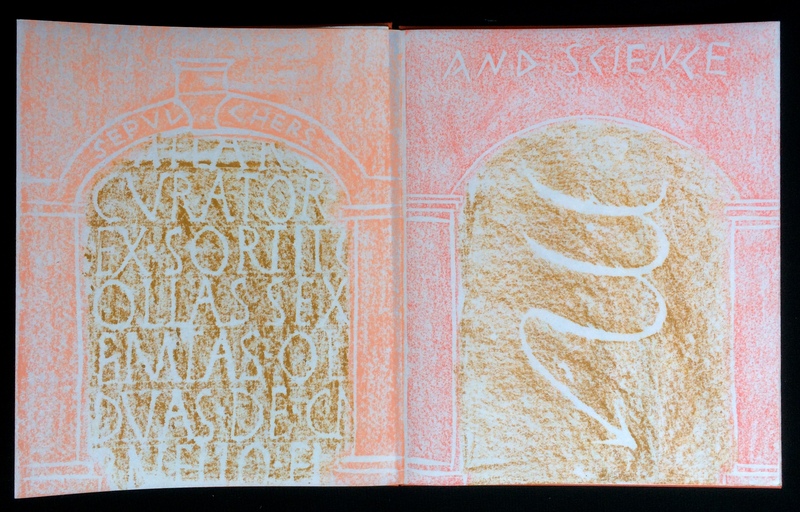 Wax was used to create the imagery of the book through rubbing. 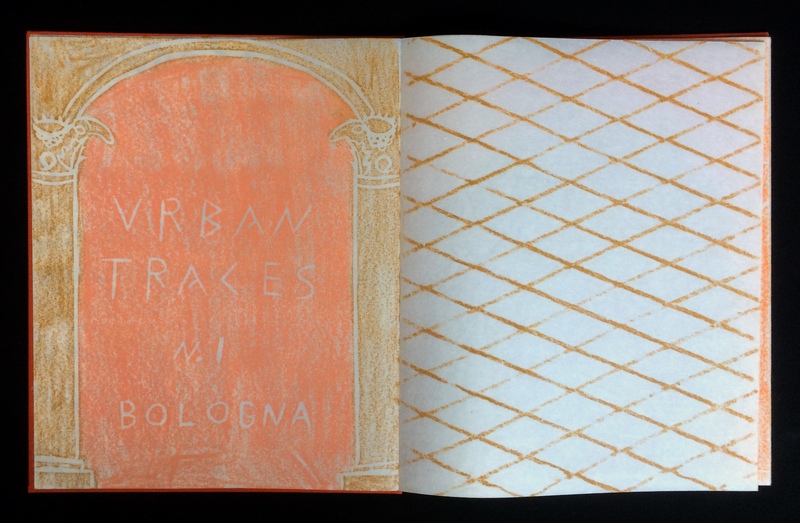 The title and text were cut into linoleum, as were eight sets of arches with columns studied from original columns and capitals present today in Bologna. Under the arches are rubbings of two ecclesiastic inscriptions, a modern sewer manhole, a radiator cover from the main building of the university, a Roman inscription, and the Virgo symbol from the meridian in San Petronio. Preceding the poem is a rubbing of a metal vent cover and following it is an Art Deco sidewalk vent from Via D’Azeglio. Inside the covers are checkered aqueduct manholes and part of the meridian from the floor of San Petronio. The book is made from a single folded sheet of Japanese rice paper. 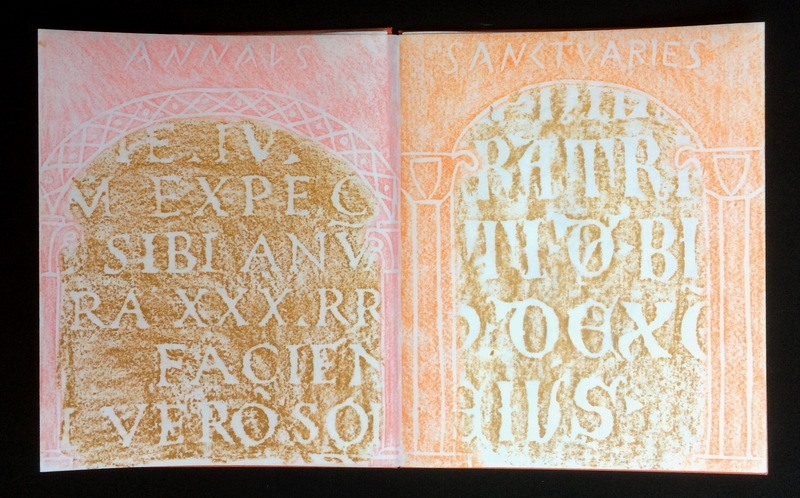 Cover stamped at Stamperia Valdonega.